Using the Woodware brush, and Purple Ink, Cover the Tag with a dusting of ink. Placing the Crafting sheet underneath to get the edges without staining your surface underneath. Use Stencils to add ink pattern in a darker colour of ink. emboss the butterfly die cuts and colour with the inks. Stick the butterfly's to the to tag using the Stix2 Glue Stick and trim off the edges where needed. Using the Hot Melt Glue Gun create little dots down the back of the butterflys. Allow to cool and press the transfer foils on top to create the shiny dots. (Remember the Transfer foils are dull side down). 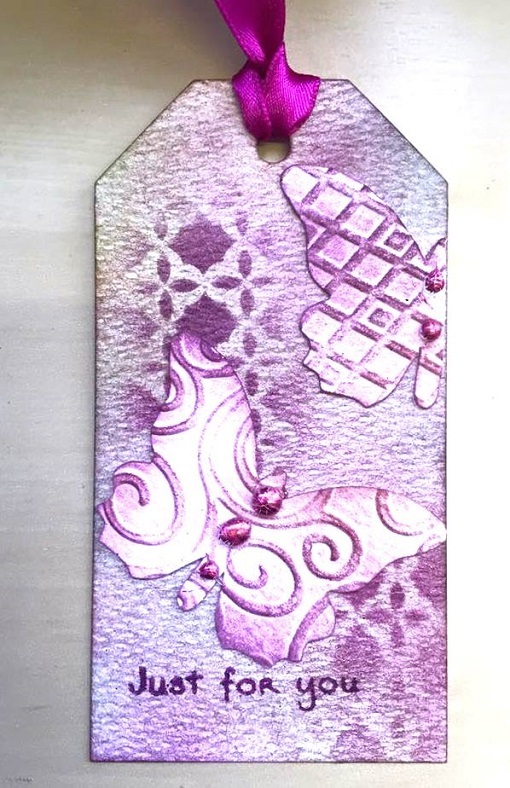 Stamp your sentiment onto the tag and add ribbon to finish.